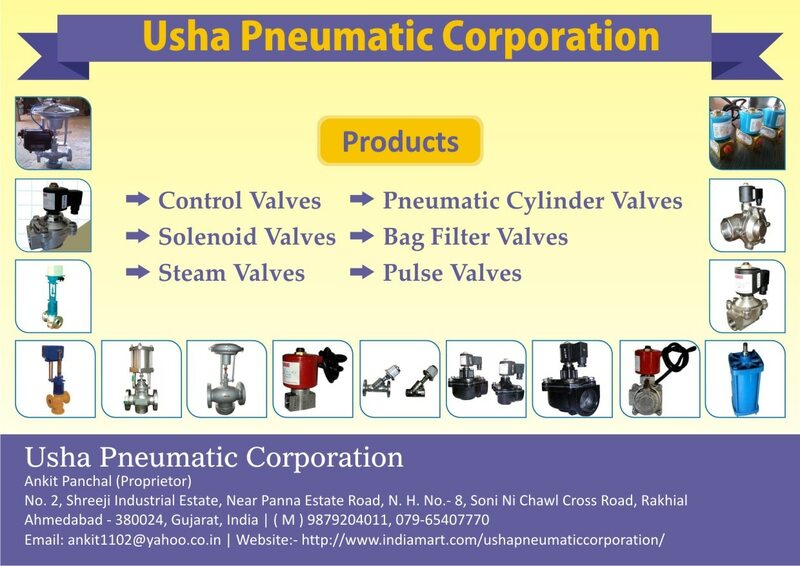 We Usha Pneumatic Corporation is engaged in manufacturing control valves since long and this control valve is a product used in controlling fluid flow in a varying size of the flow space and directed to a signal from a controller. Its enables the direct control of flow ratio and also the process quantities like pressure, temperature, and liquid level. Solenoid Valve and Its Working : Usha Pneumatic Corporation is engaged in manufacturing Pneumatic Solenoid Valve and here we present the function of the Solenoid Valves. 1) Body : Solenoid Valve is usually connected in the flow pipeline for the process of controlling the flow of fluid liquid. The flow is controlled by the handle attached with with it, and in our Automatic Pneumatic solenoid valve it is conected with the Valve. 2) Inlet Port : To enter in the finall dastination the fuild passes from the port to the Automatic Solenoid Valve. As being a prominent manufacturer & Supplier of all type of SOLENOID VALVE. We are offering highly demanded product of the industry is PULSE JET SOLENOID VALVE. It is also called LARGE FLOW QUICK ACTION DUST COLLECTING VALVE. This product is designed to match all the basic requirement of the market. We purely use premium quality of raw material that also sourced from the trusted vendors of the market. More details are mentioned below. Technical Specification :- 1. Body : S. S. 304/CF8. 2. Temperature : 125 Degree C. 3. Pressure : up to 10 kg/cm2. 4. Coil Voltage : Standard : 220 VAC. 5. Connection : B.S.P ( Female ) 6. Fluid : Air. 7. Seals : Polyurethane diaphragm bune 'N' 8. Application : ON/OFF. PULSE JET SOLENOID VALVE MANUFACTURER We offer comprehensive range of assure quality PULSE JET SOLENOID VALVE. Our offered range of product is also known as LARGE FLOW QUICK ACTION DUST COLLECTING VALVE in the market. We are willing to supply PULSE JET SOLENOID VALVE in pune maharastra india. Pulse Jet Solenoid valves, Highly demand in Bag Filter system. Full flow. Large Orifice, Spring less Operation. Power supply 230 V AC/24 V DC/12 V DC. Use in De - Dusting System. Our Product PNEUMATIC CYLINDER OPERATED CONTROL VALVES is a highly demanded in the industry like pharma, chemical, cement plant, Power plant, steel plant etc. Our product quality is always appreciated but esteemed customers. We used the raw material like Cast Row 15210, CRFG. This Control Valve is widely used in the medium like Air, Oil, Gas, Steam, Water. More specification are mentioned below. Specification :- It's Full port orifice the maximum flow of fluid. Body is manufactured with raw using Cast Raw 15210 CRFG Steam Material is AISI 304. Pneumatic pressure started from 3 Bar to 7 Bar. We are engaged in offering a comprehensive range of Pneumatic Products to the industry. Our product 'Y' TYPE CONTROL VALVE is WIDELY used in the industries like Chemical, Pharma, Stainless Steel, Cement plant etc. These Control valve having self cleaning features. Its full flow with negligible pressure drop makes it more demanding. Its very easy to mount and can fix to any congested place because of its designed shape. We offer this product with a market leading price without compromising with quality. Hence, we are able to provide the best quality of the market. Features. Highly Durable. Easy to fix. Quality assured product. Type :- Normally Close. Normally Open. Y Type Control Valve We "Usha Pneumatic Corporation" are prominent manufacturer and Supplier of Control Valves and our range includes Y Type Control Valve. These Control Valves are having various features like, Strength High, Durability strong, Good Resistance in any harsh situation, Having Self Cleaning capacity, with on and off facility, can operate speedy and multi operation, its shape id design in accordance to suit every for mounting, Flow is negligible pressure drop, Normal Close Normal Open, Size range starts from 1/4” to 4” screwed and flanged both.